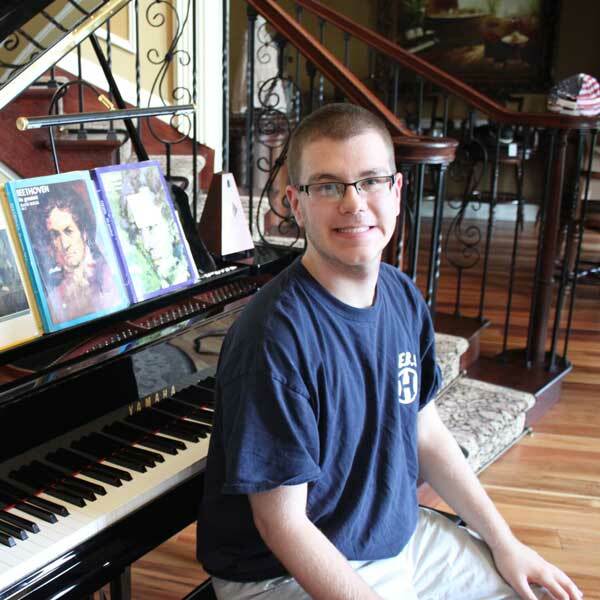 Brandon enjoyed playing piano on his own and was self-taught until 4th grade, when the family decided it was time for piano lessons so that he could learn to read music. He has continued with the same music teacher until this day. He added additional lessons during his sophomore year of high school to help him prepare for recitals. Today, he receives two piano lessons per week and gives two recitals per year, in addition to performing at his high school concerts. Above all other genres of music, Brandon’s favorite style is classical. He loves Mozart, Beethoven, Chopin and many more. In addition, he loves to play any music that is meaningful to him. He practices well in advance of any concert or end of year show, and loves to simply sit down and play any music that he hears. Brandon currently attends Howell High School with a 1:1 aide in the Autism Program. At 21, he will transition into an adult program, which the family hopes will have a music component.